Photo measuring slightly more than 6.25 x 4 inches. If only I could figure out what the insignia on their chests represented, I would have a better idea of who these guys were. A college team? Some fraternal organization? 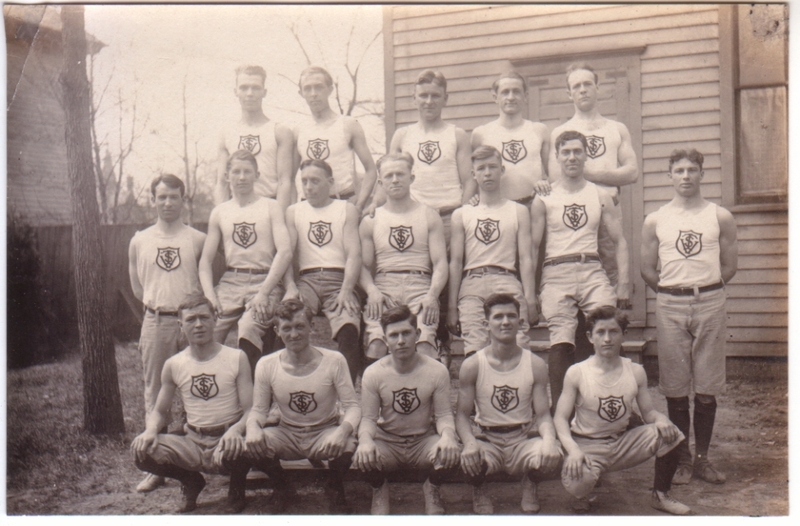 If I had to guess, I’d say this was a track & field team, based on other team photos I have, but I’m not sure. And what are they standing and sitting on for this pose? Other similar team photos show guys lined up on stadium bleachers, but these guys seem to have rigged up something for the occasion in their back yard. I guess that means they’re a scrappy, resourceful little team, and I say good for them. 26 Sep 2011 at 10:50 am M.O. The logo seems somewhat nautical, but I may be wrong. I really like old photos of athletes! I hope you have more! Thanks! Yep, I like them, too, and I have more. I’m just trying to maintain some variety in this blog and not post too much of the same thing in a row, no matter how much I may be tempted. I’m thinking the insignias were home-attached, which explains the noticeably askew one on the guy off to the right. They’re not all wearing the exact same top, so it must have been a provide-your-own thing. Yes, I noticed that the shirts aren’t identical. It’s not like today where you’d e-mail a jpeg of an image that would be mass-produced on identical uniforms. And I could be wrong, but this doesn’t look like a school that could have afforded slickly produced uniforms, even if such options existed then. As for the initials, yes, it was hard to decipher them. I tried Googling several combinations, but so many options came up that I gave up pretty quickly. For all I know, it might be a school that no longer even exists. And that’s assuming this is a school team in the first place.